Perhaps you’ve been watching the BBC’s Spy in the Wild, in which meticulously recreated robotic animals cohabitate with their fleshy brethren and record all their secret goings and doings. But haven’t you ever wondered what fruit gets up to during the long trip from its homeland to your local produce department? 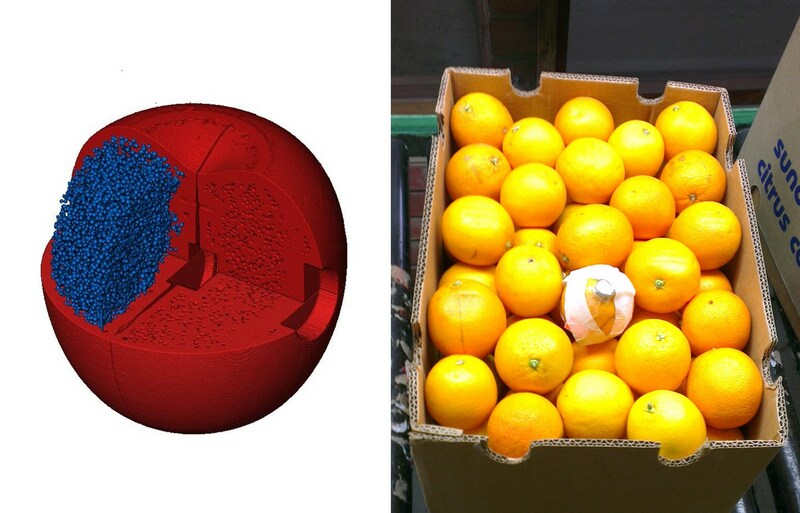 These robo-fruits, from Swiss R&D firm Empa, are your best bet to find out. Of course, it’s not for a nature documentary, but rather for the shippers and grocery conglomerates that want to make sure their apples and oranges are arriving at their destinations untroubled and unbruised. And it isn’t a high-definition camera but a temperature sensor. What were you expecting to see, after all, in a cardboard box, in a dark truck? Don’t be ridiculous. The issue at hand is simply that constant and even refrigeration is necessary to keep fruit fresh and critter-free during transit. But having a thermometer in the truck, although critical, isn’t very exact. After all, isn’t the temperature different at the top and bottom of the bed, the inside and outside of the pile of fruit boxes and the front and back? For that matter, are the apples cold all the way through or just on the outside? Ordinarily, shippers would test this by pulling an apple out of the truck and testing its core temperature, but that’s time-consuming, might affect the temperature and, of course, you aren’t going to pull an apple from the center of the pile. These little robo-fruits are the solution. They’re molded to the exact shape of the fruit itself, and the material they’re made of is customized to be the average density of the fruit, as well. That means they’ll act just like one when it comes to settling in their box, warming and cooling and so on. You pull it out at the end of the ride and see how it fared — they’re still working on adding wireless. “We are developing separate sensors for each type of fruit, and even for different varieties,” said project leader Thijs Defraeye. Right now they have Jonagold and Braeburn (my favorite) apples, Kent mangoes, oranges (unspecified type, probably navel), and “the classic Cavendish banana.” I’ve never called a banana by name like that, so I’m guessing they mean banana bananas. “We have conducted comparative tests, and our filling provided much more accurate data and simulated the behavior of a real piece of fruit much more reliably at different temperatures,” Defraeye continued. Now, it’s not like we didn’t have the ability to make fake apples before now. Even 3D-printed ones (as the mold is in this case) we could have done many years ago. But I seem to remember wax fruit going back at least a century or two.